Grantham Journal 15/9/1917: Funeral notice for the late Mr William Allcorn. Frederick (Fred) Allcorn was born in Bottesford in 1891, one of the children of William and Elizabeth Allcorn. William, his father, was born in 1856 and came from the village of Pembury, Kent. By the time he was fifteen he was working as a carter’s boy in Frant, East Sussex. Sometime later, he started work as a railwayman. By 1881, he had become a railway signalman, and had been posted to Bottesford. He was also by now a married man. His wife, Elizabeth, was born in 1856 at Frant. Their first child, Arthur William, was born in Bottesford in 1880. They lived at 2 Elton Road, one of the terrace of four cottages below the embanked railway bridge on the road from Bottesford to Elton and Nottingham, which are still known as South Station Cottages. In the Census of 1891, their home was recorded as 2 New Station Cottages, at New Railway Halt, Nottingham Road, Bottesford. This was most probably the same house as ten years before. There were now five children at home: Arthur William (11), George (9), Florence (7), Beatrice (5) and Percy Leonard (3), all except for Percy at school. In January 1910, Fred Allcorn married Mary Ann George, born at Eaton. According to the Census of 1911 they lived at 6 Orston Lane Cottages, one of the row of nine cottages on Orston Lane (on the southern side of what is now called Bowbridge Lane, close to the junction with Pinfold Lane). Fred was working as a platelayer. They had a daughter, Florence Louisa Gertrude, aged 8 months. Few details of his service record have been located. However, Fred Allcorn is one of the men on the Bottesford list of Absentee Voters, 1919, his home address ‘High Street’, 289474 Sap. R.T.E. (Railway Transport Establishment). 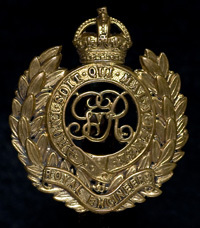 His Medal Index Card confirms that he was in the Royal Engineers and records that he had two service numbers, 289474 and WR220385. His sub-unit was the Railways Corps. He was awarded the Victory Medal and the British Medal. The Electoral Register from 1926 records that Fred and Mary Allcorn lived on Bottesford High Street, while his father William and sister Lily lived at the West End (perhaps still at South Station Cottages). The 1939 register gives the address Blue Bank, Grantham Road, Bottesford, where lived Frederick Allcorn, born 26th July 1891, a platelayer, his wife Mary Ann, born 31st July, 1881 (ten years before Fred), and Evelyn M Jackson (nee Allcorn), born 17th October, 1914. 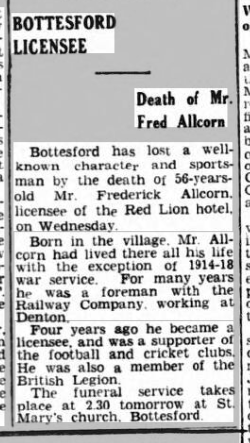 Fred Allcorn was the licensee of the Red Lion public house, Bottesford, when he died on the 1st October, 1947, aged 56, leaving his estate of £1136 2s 4d to his widow. Mary Ann Allcorn died on the 13th September, 1964, aged 83.